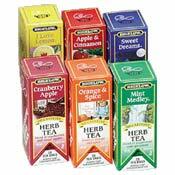 Bigelow Teas by the case. Each case comes with 6 Boxes of 28 individually wrapped Bigelow Teas. Choose below. Buy Bigelow by the case and save a little $. 168 Units Total. This is a case of 6 Boxes of the Same Bigelow Tea. If you Order I Love Lemon, you will recieve a case of 6 boxes of I Love Lemon. Don't forget that you earn a 4% Discount in Redemption Points on all products at cvcoffee.com!